Each participant received a free book from these titles and more. Jonathan Lykes of BYP 100 led the crowd in freedom songs and liberation chants. Alex Huttsinger demonstrated how to make social justice prints. The curriculum fair included a special presentation by Jonathan Lykes, BYP100 national board member and the Black Joy Experience artistic director and co-producer. Lykes led the group in freedom songs and liberations chants that teachers can bring to the classroom. I loved finding ways to make the principles accessible to young children – especially finding literary connections. Makes tackling big ideas seem more do-able! I loved hearing from the 4th graders who shared their work of historical fiction and the scaffolding about who has access to family tree / ancestry info. One important thing I gained from this event were all the resources and organizations. I can’t wait to look more into them. The chants were great. The books were even better. Below find resources shared at the curriculum fair as well as photos and video from the event. Meet key organizations and browse books for early childhood through high school age students. Introducing the Black Lives Matter 13 Guiding Principles in early childhood education. Facilitated by Nichelle Dowell, early childhood teacher. Black Muslims in the United States. Introduction to a middle and high school lesson. Facilitated by Alison Kysia, project director, Challenging Islamophobia. Facilitated by Dani McCormick, 4th grade teacher and her students. Introducing the Black Lives Matter 13 Guiding Principles in middle and high school. Facilitated by Bishop Walker, middle school teacher. Introducing Key Postsecondary Metrics in High School Curricular to Better Address Social Justice in African American and Latinx Communities. The purpose of this workshop is to present high school-level personnel with the major Internet-based dashboards to better help them advise and guide high school students about college choice. Learning outcomes include participants: navigating major college-related dashboards that present pertinent metrics, including “College Navigator,” “The White House Score Card,” “College Results,” and “College Completion” project; (b) learning and teaching high school students about colleges and universities with stellar retention, persistence, and graduation rates; and (c) improving African American and Latinx students’ return on investment related to college choice. Participants are encouraged, but not required, to bring their laptops. Using African Rock Art Image Analysis to Learn about Science and Indigenous Black African Cultures. 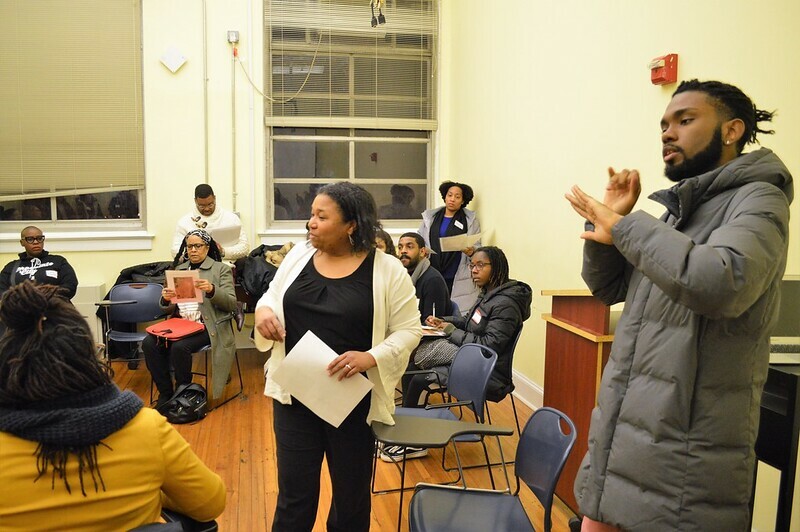 Facilitated by Dr. Catherine Quinlan, assistant professor, Department of Curriculum and Instruction, Howard University. Participants will be introduced to the scientific practice of using images as data. They will also learn about the science behind African rock art, what scientists have learned about them, and briefly explore applications for the classroom. Available resources for implementation in the classroom will be shared. Lesson for early childhood classrooms about representation and activism using the book Milo's Museum. Facilitated by Brittany Leavitt, early childhood teacher. Art and community activism using children’s literature such as A is for Activist, She Stood for Freedom, and more. Facilitated by Julita Brown, elementary school teacher. 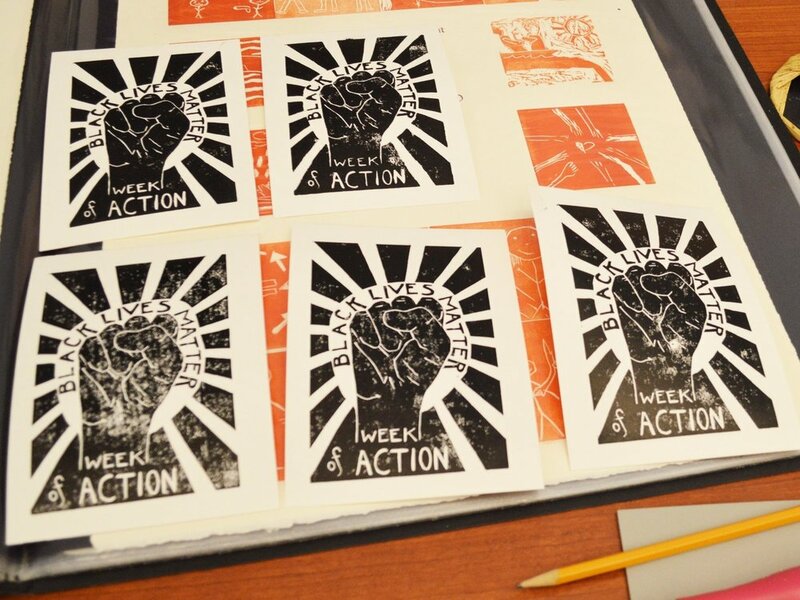 Social Justice Printmaking Workshop for middle school. Facilitated by Alexandra Huttinger, printmaker and arts educator. Congo, Coltan, and Cell Phones: A People’s History. Introduction to a high school lesson. After greetings from the event's co-hosts, Jonathan Lykes, BYP100 national board member and the Black Joy Experience artistic director and co-producer will lead the group in freedom songs and liberations chants that teachers can bring to the classroom. Meet and talk with groups including D.C. Historical Society, Dignity in Schools, Center for Inspired Teaching, For Humanity: Culture, Community and Maroonage, Racial Justice NOW! DMV, Shout Mouse Press, and many more. Our thanks to the following publishers for donating children’s and young adult books for the Black Lives Matter at School Week of Action curriculum fair. We also extend our thanks to individual donors who sponsored the event and allowed us to give away copies of the Rethinking Schools publication, Teaching for Black Lives. Please consider making a donation today.